I can't believe my baby girl is 3! 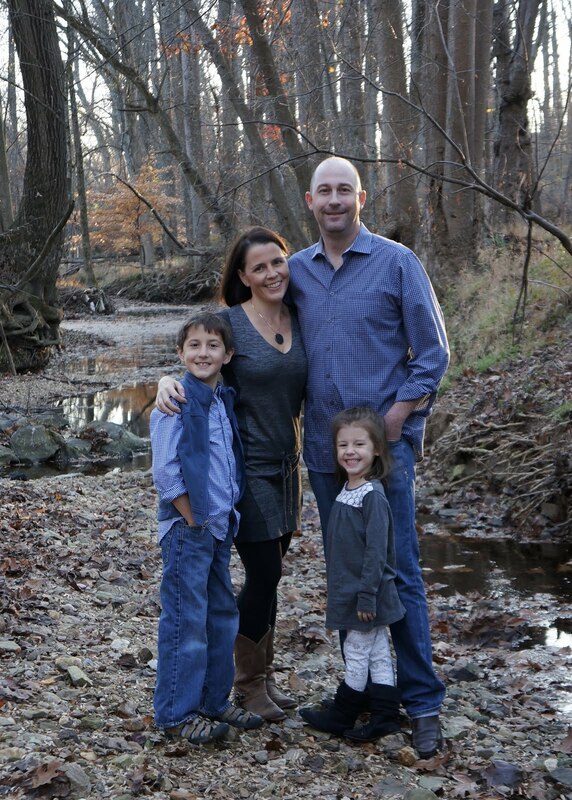 We celebrated the big day with 18 other children and their parents a couple of weekends ago. She told me she wanted to have a purple pony party. As I started to plan, the theme evolved into Rainbows and Unicorns. The birthday girl was very happy with the end result. 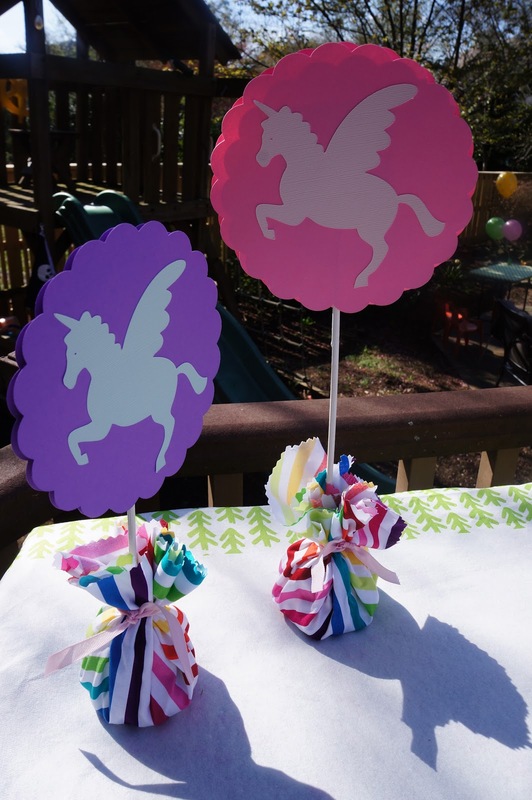 I made about 10 of the unicorn sign/center pieces pictured above. To make them I used my Silhouette Cameo to cut two large scalloped circles out of card stock, and a unicorn and a large number 3 out of adhesive backed card stock. I stuck one unicorn on one circle and the three on the other. Next, I used double sided tape to attach the circles to a small square of foam board. I painted the wooden sticks (that I found at a craft store) white then stuck one end of the stick into the foam board (the foam area between the paper) and the other into the top of a small candle that I had removed the wick from. I wrapped the candle with some fabric and ribbon. 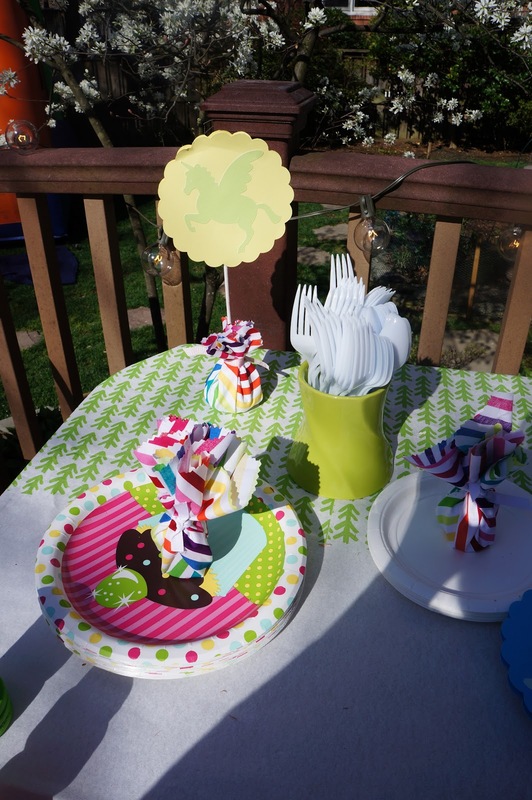 I did something similar for a surprise party for my mom so I'll post a better how-to with pictures later this week. I used more of the rainbow fabric to wrap the base of a vase. To do this I found a glass that could hold all of the flower stems and fit inside of my vase. I filled the cup with water and set it aside. Next, I placed the fabric right side down on a table and placed the vase in the center. I folded and tucked the fabric up into the vase then placed my glass inside of it to hold every thing in place. I added the flowers last. 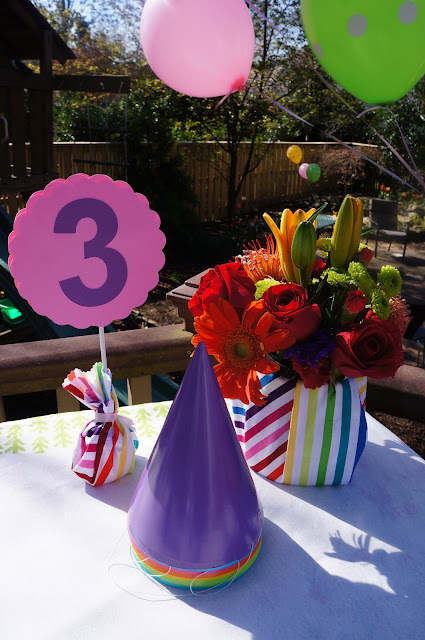 I found the simple, solid colored party hats at A.C. Moore. I ordered the fabric from here. I used extra candles wrapped with fabric as weights to keep paper goods from flying away. 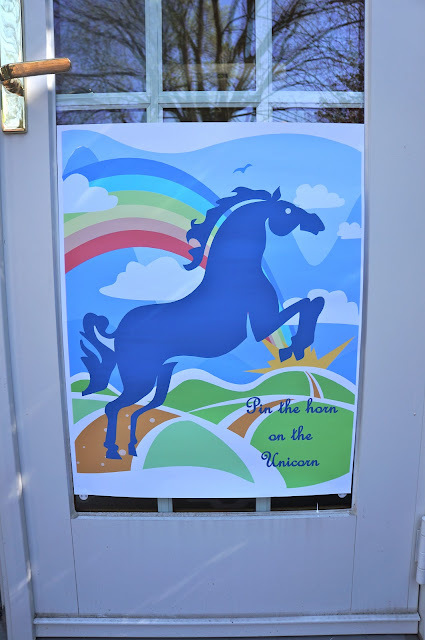 We played pin the horn on the Unicorn using a poster I created with clip art in Word and had printed at Kinkos. For favors I used my silhouette to make each child their own cup. The boys got dragons and the girls got unicorns. I found the cups on Amazon. I had to buy more than I needed (24 for $2.50 per piece) but I figure I'll find a use for them - teacher appreciation week is right around the corner. I scanned a picture my daughter drew and "added thank you for coming to my party" to it. I placed a reduced sized copy of the picture in each cup. I would have loved to have made and decorated a cake, but simply ran out of time. The unicorn toppers (also made with the Silhouette Cameo) and rainbow sprinkles were a hit with the kids, which is all that really matters anyway. 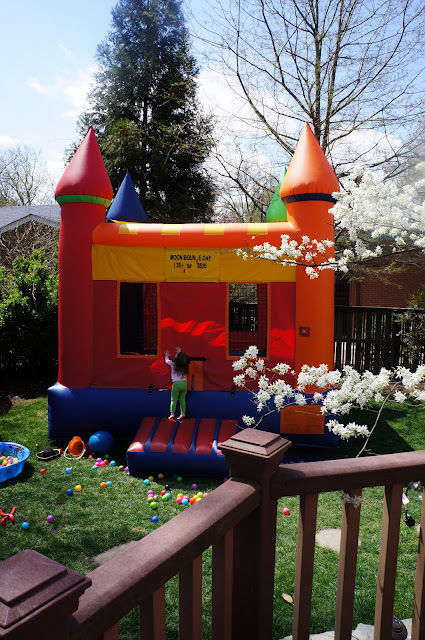 In my opinion, the moon bounce was worth EVERY Penny. The kids loved it and it kept everyone outside and out of my house. To keep the littlest guests happy we brought out the ball pit. Once they got in, they didn't want to get out. All in all it was a great party. I could have gone all out with the theme, but I am glad I didn't. The party was easy to set up and clean up, the kids had a ball, and I actually got to relax a little and enjoy the party too.